What Are the Best Demand Planning Software Tools for 2019? We all know the feeling: finding a product on Amazon (or looking at your favorite brick-and-mortar) only to see it’s unavailable or out of stock. It’s a common problem for consumers, yes, but an even larger issue when it comes to supply chain management software. The answer? Demand planning software tools. Demand planning software solutions bring the power of forecasting into a company’s processes. Ultimately, these tools let you serve your customer base more effectively by planning your production and inventory in advance instead of reacting to market shifts at every turn — a vital part of business success. After all, you can’t bring in revenue and keep the lights on unless you’re consistently meeting consumers’ needs in a timely manner. So, how do you know which solution will give the best ROI for your specific needs? What are the top options on the market? Demand planning and demand management are similar, but think of them as siblings instead of twins — related yet different. Demand management software deals with short-term supply and demand issues. On the other hand, demand planning takes the long-term view into account. Using predictive analytics, it helps decision-makers look forward to future demand instead of keeping their view limited to the present. Equipped with this information, your business will be more prepared to handle upcoming market needs by having enough stock on hand. The result? An increase in sales thanks to the ability to meet the demand. Demand planning is often a particular feature of an encompassing package for supply chain management (SCM). Why SCM? Because when the raw supplies come to company locations, the company keeps them to manufacture the products they’ll deliver to customers when demand occurs. Since demand planning gives you a better understanding of what will be ordered in the future, it can help improve the supply chain process. Your company can take significant advantage of this form of business intelligence by using demand forecasting and planning to generate better product life cycles and ROI. Now, let’s get detailed for a minute with planning and forecasting software. First up, trends. The supply chain is a complex, interconnected web of technology, processes and people. And at the center of it all, a never-ending flow of data acts as the engine. Operating a business without data intelligence is the modern equivalent of piloting a Boeing 747 through a storm with the instruments not functioning — you’re flying blind. This is why over 80 percent of manufacturers consider real-time monitoring a crucial part of their success. It provides context for the data and gives insight into things like product quality and machine performance while revealing problem areas. Such visibility helps keep your business flying high. That’s a pretty jargon-stuffed phrase, but basically, knowledge sharing networks are the result of integrations across BI, analytics, track-and-trace applications and quality management. Combining on-site legacy systems with 3rd-party and cloud applications creates a platform that allows supplier connection, along with greater speed and scalability. The amount of data at our fingertips underpins the importance of collaboration across all aspects of the supply chain. Data reliability and accuracy are important, but in order to reduce costs and waste while improving results, companies also rely on data that provides a single version of the truth and that can be shared freely. To be most effective, collaboration should involve every department across an organization, along with retailers and suppliers. The presence of AI has become as common as sliced bread, and by 2022, its global business value will reach almost $4 trillion, according to Gartner. Though it, along with machine learning, has yet to receive widespread adoption in the supply chain industry, that’s on track to change. As mentioned in our post looking at trends across the entire supply chain, cloud systems are poised for greater use moving forward, as companies overcome concerns regarding security and uptime that come with 3rd party vendors having access to software. Another factor is globalization. With worldwide supply chains to manage, companies need easier, more effective ways of standardizing processes. Cloud solutions are a practical answer. What Does Forecasting Software Do? A critical part of demand planning is creating forecasts. To make your plans a reality, you need powerful software with the ability to process huge volumes of information. You can’t conjure inventory and resource forecasts out of thin air — they have to be based on data. How do you get these insights? Software solutions with forecasting like business intelligence tools allow you to remove and isolate data from reports, reviews, metrics and surveys. You can then turn the results into actionable statements. If there’s a peak buying period for a certain demographic, for instance, demand planning and forecasting software can analyze thousands of reports in order to identify it. Instead of fixating on the most extensive products, look for software that aligns with your requirements. An “almost” match won’t cut it. The real focus should be on tracking demand streams and drivers so that the technology provides the right kind of support for your operations. If you have little experience, opt for a product with a simple interface. Many solutions use basic dashboard interfaces to collate graphs, charts and diagrams. This will reduce your learning curve with the system, leading to faster use across your business. As with any software, it’s best to invest in a system with a broad range of functions that you’ll actually use, rather than bells and whistles that cost extra but you don’t need. Ideally, you want the option to dig down into the intricacies of analytics without sacrificing efficiency and user-friendliness. Finally, prioritize scalability. Your needs will change, so it’s essential to invest in a system that facilitates continuous improvement and growth. With demand planning and forecasting in place, you’ll be better equipped to keep the appropriate amount of inventory on hand and manage your capacity. And with the ability to create a plan using historical data insights, you can anticipate future demand more accurately. Hello supply chain efficiency! Supply planning software also aids in communication and collaboration, with solutions facilitating information flow throughout the supply chain network. This leads to greater visibility and real-time updates for teams and stakeholders. Portals grant access to key information such as supply schedules, inventory stocks, customized orders and more. Data aggregation: Before you can start making the data work for you, you need to search the available information and bring it all together in a report-based summary. Trend analysis: These features take past information into account and produce forecasts that also consider fluctuations in data. Think of the lack of demand for winter coats during the summer season, or promotions that likely boosted results for a given period — there are many reasons the data may not accurately reflect ordinary demand. Predictive analysis: Basically the real-life version of fortune telling (except founded on data), predictive analysis uses techniques from machine learning and statistics to make predictions based on current data. Your forecasts are only as good as the data you have. Thanks to demand planning solutions, you don’t have to keep shooting in the dark and hoping you’ll hit your target. The ability to aggregate and analyze endless amounts of information means you can expect more accurate forecasts. When you have a reliable view of future demand, you can control inventory appropriately. Avoid the pitfalls of short-term planning by looking at the big picture. Demand planning systems ensure inventory managers place the appropriate future orders based on projected demand. You won’t have to worry about extra stock piling up in your warehouse, or more importantly, running short on supplies when a customer’s needs exceed what you have on hand. All of this leads to those magical words: cost reduction. Sleep better at night knowing your bottom line isn’t going to suffer a severe blow, either in the form of products gathering dust on the shelves or by dropping big bucks to rush an order because you’re suddenly short 300 units and the customer is beating your door down (figuratively, of course). The question now is, which solution will give you what you need? The demand forecasting solution is a powerful feature. If you need to get an idea of what demand will look like, a range of features are there to help: predictive analytics, non-linear regression, pattern matching and autonomous machine learning techniques. Historical sales forecasting gives you a window into seasonality and trend insights. JustEnough also takes care of identifying a forecasting technique. It automatically makes a selection by running a tournament with 14 methods and shortlisting a methodology based on best fit and low MAPE (Mean Absolute Percentage Error). You’ll also be able to get your promotion planning in order. When you plan to rerun a promotion, you can flag the historical promotion dates from the previous time. That way, you’ll be able you to create a more accurate forecast for the period when the next promotion runs. It even provides options if you’re preparing to launch a new product that doesn’t have sufficient sales history. The software lets you create supersessions to capture seasonality info for an item. JustEnough does more than its name implies — it covers a wide range of functionalities and provides synergy with other Mi9 solution offerings. Our second selection is Oracle Demantra, a demand management and supply chain tool that’s part of Oracle’s E-Business Suite. By tracking demand alongside factors like inventory counts, supply limitations, client commitments and more, it supports and facilitates automated forecast processes. With Demantra, it’s easy to take control of your day-to-day planning routines. Demand Management: enables you to gain alignment throughout your organization, as well as shape and refine new products based on the successes and failures of previous products. Real-Time Sales and Operations Planning: equips you with planning tools and lets you build the foundation for a fully responsive sales system with the ability to drive best practices. Predictive Trade Planning: gives you tools that cover each stage from forecasting to evaluation, as well as offers a detailed sales and account planning domain that you can access and manage from one user-friendly interface. Oracle Demantra promises reliable automated predictions, real-time visibility, increased customer satisfaction and greater harmony throughout every supply chain process. Demand Solutions offers demand planning software that gives you 360-degree visibility into all aspects of your business. Their customers range from small enterprises up to Fortune 500 companies, so no matter where you fall on the spectrum, they can manage your needs. The dashboard view shows you real-time fluctuations in demand and supply. Powerful forecasting models provide excellent accuracy. You can plan your inventory based on hard data rather than guesswork. You can manage new product launches objectively. A clean, easy-to-use user interface lets you focus on the details of your operations instead of getting distracted by the software. One major advantage of Demand Solutions is its integration with ERP solutions. With a seamless connection established, you can create a free flow of data in and out of your ERP system. Its sharing functionalities also give you the ability to collaborate, giving all stakeholders insight into your forecasts. With full visibility that helps you make better decisions faster and the ability to fine-tune your planning process, you’ll have greater control over your supply chain. As part of its supply chain management system, SAP offers Advanced Planning and Optimizer (APO) modules. APO isn’t a standalone solution and integrates with the ERP offering. The Demand Planning component analyzes current and historical data to gain a detailed picture of market interest in your products. With the help of dynamic macro processes and statistical forecasting, it uses causal factors to determine how many products you can sell as long as you buy the right materials. The thing to remember about APO is that it’s constantly strategizing. It’s able to conduct self-directed and pre-configured tests on forecasting models so that the parameters used to make predictions are always relevant and reliable. Plus, with the “Cockpit” interface, you can access every significant supply chain component from a basic three-tiered screen. A word of warning: while APO has been SAP’s standard solution for supply chain management, that’s changing as SAP phases it out over the next several years. Support will be around until 2025, but you’ll want to weigh whether it’s worth it to invest in a system that’s sunsetting in the not-too-distant future. For specific replacement of the supply network planning and demand planning modules, you can turn to SAP’s Integrated Business Planning (IBP) cloud solution. IBP also gives you capabilities such as inventory optimization, response and supply planning, S&OP and more, providing you with a powerful collection of features for real-time monitoring. If you need features such as production planning, global availability or detailed scheduling, you’ll need to turn to SAP S/4HANA, a business suite built on their proprietary database. Looking for an end-to-end supply chain planning solution? Atlas Planning Suite is a solid choice. It caters to a number of specific industries in the mid-market segment, including consumer goods, manufacturing, pharmaceuticals, high tech and more. Demand Management Engine: Hit strategic goals and gather sales thanks to demand forecasting and exception management. Planning Portal: Collaborate with staff as well as customers and suppliers to get visibility into your markets. Inventory Management: Optimize your supply chain by managing orders, issues and inventory levels. Scenario Analysis: Understand each product so you can strategize in any situation. Capacity Planning: Ensure your production capacity meets demand so your supply chain can realize its full potential. On top of enabling full management of your supply chain planning, Atlas includes support to give you a better experience. An online knowledge base and training packages ensure you get the most out of the system. Logility promises to help businesses reach unprecedented levels of accuracy when it comes to forecasting. With its Voyager demand planning and forecasting software, you can combine next level scheduling with real-time inventory management. It has the ability to cut costs and boost profitability, allowing you full control over demand segmentation and eliminating wasted inventory. It offers machine learning and analytics, which enable fast, informed decision-making. With this information, you can accurately model impact and optimize everything from product launches to end-of-life products. Best-in-class forecasting tools produce logistics, sales, marketing and financial predictions according to the parameters you establish. Big data evaluation identifies patterns and demand signals you can act on. It collects data from sources ranging from POS (point-of-sale) to social media to highlight problems and enable you to respond accordingly. With a focus on real-time forecast accuracy, inventory optimization and collaborative forecasting, JDA’s demand management module helps businesses streamline supply chain operations and maximize resources. Most importantly, it wants to show users that multiple objectives and priorities can work together. Prepare forecasts that take all data and goals into consideration. View summarized information on dashboards. Compare forecast data, financial goals, inventory levels and more, with flexibility to update any aspect. You have the chance to transform your business and implement dependable processes that you can activate at speed. You can integrate responsive Plan–Do–Check–Act functions to encourage and support the perpetual fine-tuning of supply and demand scenarios. With the Luminate Demand Edge SaaS solution, you can get greater control, visibility and accuracy thanks to AI and machine learning algorithms. The demand planning application from Kinaxis is only available via its S&OP solution. According to the vendor, the best way to squeeze maximum value out of the software is to combine it with the Order Fulfillment or Aggregate Supply Planning tools. However, as a standalone module, RapidResponse Demand Planning works to construct demand forecasts that focus on creating consensus. Collaboration: The setup emphasizes communication across the functional roles of marketing, S&OP processes, finance, sales and demand planning. Recommendations: Get suggestions from shareholders and team leaders from key departments. Together, you can work to control and minimize risk, as well as balance customer needs against the size, scope and power of your supply chain. After all, the most successful demand plans welcome input from everybody. If you want the ability to assess plans for risk or variance and make adjustments accordingly, RapidResponse does that too. The concurrent planning functions offer opportunities to unite demand objectives with supply chain and strategic capacity processes. This makes it easier to track and tweak any parts of your demand plans. Kinaxis also has a reputation for stress-free deployments. It builds all of its software solutions on best practices and standard process flows, so you’re guaranteed a quick and stress-free launch. Once you’re up and running, the interface is easy to use and navigate. In early 2017, software vendor E2open acquired demand planning company SteelWedge. The move was part of a bid to broaden its S&OP functions by incorporating cloud-based planning solutions and services. Demand sensing: generates forecasts based on real-time data. Inventory collaboration: provides multi-tier visibility into current stock. Sales order collaboration: produces greater productivity and efficiency for workflows that are labor-intensive. Forecast collaboration: brings multiple stakeholders into planning for heightened confidence in the forecast. Also, as a cloud-based module, it offers an extra layer of scalability. Thanks to the SteelWedge best-of-breed capabilities, E2open leverages cloud technology, industry expertise and sophisticated analytics to allow decision-makers to collaborate on supply and demand processes. The overarching goal is to be the central cloud hub for real-time supply chain operations. If you’re looking for a solution that’s based on simplicity and ease of use, you might want to take a look at Blue Ridge. The demand planning and forecasting modules are part of the Cloud Supply Chain Solution. Leverage customer demand to produce dynamic predictions and enhance processes such as stock replenishment. Get complete visibility so you can respond to changes that occur. Identify and reduce surplus inventory. Evaluate every single transaction that travels through your supply chain. The software converts actionable insights into day-by-day, week-by-week windows into the business. With support from its PrecisionPlanning technology, Blue Ridge skilfully transforms market interest into a carefully managed, fully optimized demand and supply plan. Furthermore, you can configure the solution to fit the requirements of your company. Finally, Blue Ridge offers a unique LifeLine service, where supply chain consultants monitor all internal activities. They’re responsible for reviewing your demand planning processes and identifying any potential problems. They can also mentor and guide your team as your new demand plans evolve. RELEX combines machine learning with intelligent algorithms to provide you with rich insights into forecast demand. It also takes external factors into account to give you a more comprehensive picture — things like seasons, trends, holidays, weather forecasts, assortment and more. RELEX works well for organizations from large to small and brings a tremendous amount of experience to the table to help you achieve continuous improvements. To that end, it provides several support features, including in-person training, webinars and documentation. Omni Channel Planning: Support for multi-channel models such as buy online and pick up in store. Editing of Forecasts: Customers of the software can edit the demand forecast to any level of granularity. Collaborative Forecast: Collaboration between vendors, suppliers and partners is possible along with automation. Toolbox: Templates help you plan for and manage a variety of situations related to promotions, products and seasonal trends. Comprehensive Planning: The system accounts for multiple echelons and automatically includes data related to consumer demand and any planned network changes. Machine Learning: Helps identify overfitting or uneasiness about forecasts. Knowledge is power when it comes to choosing software solutions, so be sure to do your homework, taking into account the trends on the horizon. Also, keep in mind that popularity doesn’t always equal quality. Plenty of smaller products that fly under the radar can deliver brilliant results. Visit our vendor comparison to see the top solutions and get more info to inform your decisions. All the vendors on our Leaderboard are known for providing high-quality software activations. You can opt for a hands-off integration if you have some experience with demand planning and forecasting solutions. Or, if you need support, reach out to your chosen provider. They can guide you through the process as well as help you combine multiple systems. 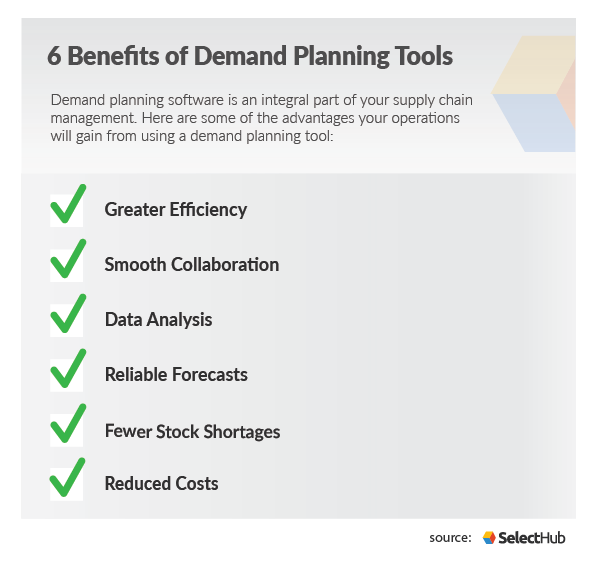 What are some benefits your company could gain from implementing a demand planning tool? Let us know in the comments!